Welcome to our next installment of Construction 101: Steel Assembly. Many of you receive our 10 day look ahead, detailing the upcoming construction outlook. In those updates we use construction terms to discuss steel assembly that may be confusing. To define those words, we’ve asked our steel expert, Vaido Vald, to take us onto the steel structure and explain what those terms mean. 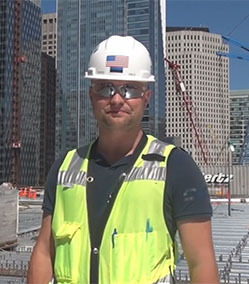 Vaido Vald is the superintendent of Skanska, the Transbay Transit Center’s steel contractor. As superintendent, he runs the day-to-day operations and quality control of steel assembly. Vaido has been working on this project with Skanska since 2013. In this video, he will help us understand key steel assembly terminology and how long the steel frame will take to build. Steel Column: A column is a vertical structural steel member that transmits the weight from the structure above to other structural elements below. Steel Beam: A beam is a horizontal structural steel member that is capable of withstanding loads by resisting bending. Pipe Column: At the Transbay Transit Center, pipe columns are the tubular shaped columns that transmit load from the supported steel above to the transfer girders, which are large, horizontal beams that are the base of the steel superstructure. Cast Node: Cast nodes are steel members that are molded from cast iron into specific shaped steel members. Cast nodes are used to connect pipe columns to steel beams and girders and transfer loads from roof level to ground level. Picking: This is a common term in the construction industry for hoisting structural steel. Different rigging is used to hoist the steel that includes wiring and shackles. Bolting: Bolted connections are one of the most common connection types on steel structures. Bolts are used to secure and connect different steel members. Welding: Welding is a fabrication process that joins metal together by heating them to the point of melting. Decking: Decking is a thin corrugated sheet metal that is spread over the horizontal structural steel members before concreting occurs.